Holiday Weekend "Made in Michigan"
Every time I look at a weather forecast for the holiday weekend, the result is different, so I’m throwing up my hands and taking a wait-and-see attitude. What we get is what we’ll get. Thursday has been lovely. 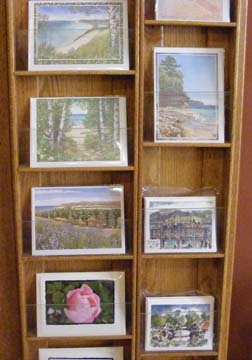 Lake Superior Month (June) at Dog Ears Books was a lot of fun, and I still have books, puzzles and CDs in stock from the U.P. Now for July, thanks to artist Kristin Hurlin from Glen Arbor, I have some new made-in-Michigan items from much nearer home. Hurlin’s single notecards are being offered individually for $3.50 or in a pack of eight for $20, with all 8-packs featuring four different designs except the one that has two tree-designed cards (Balsam fir and white pine), the trees being a new project she has just started. (One of Hurlin’s original paintings, from which the cards are printed, sometimes takes as long as long as a month to finish.) 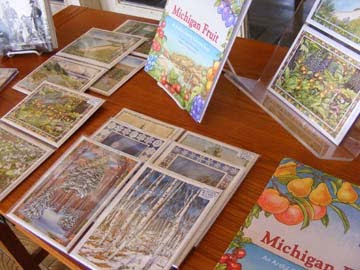 There is also a beautiful coloring and activity book, illustrated by Hurlin, that features Michigan fruits, showing flowers and cross-section drawings and plants as they grow on typical fruit farms. It makes me happy to have such beautiful items to display in my bookstore, and the card rack definitly needed filling out. Now with Kristin’s and Ellie Golden’s artistic work added to my modest photograph notecards, there’s lots of color and variety. There was a young newbie in Northport today, a Sheltie pup named Laddie, adopted from "down Cedar way" and moved up to our neck of the woods for the summer. I'd call him Sarah's new friend, and it's true that they are interested in each other and have no ill will, but neither have they quite made up their minds about the relationship, either. 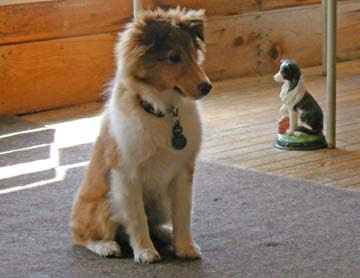 Scroll back up, though, and see again how cute Laddie is posing near the doorstop dog! I don't think Sarah will be able to resist this adorable Michigan pup for long, do you? In a grocery checkout line in Cincinnati with a fellow graduate student, I noticed that the clerk’s curiosity was awakened when she heard my friend’s speech. To American ears, her English—one of two native languages she had grown up speaking—sounded accented. “Where are you from?” came the inevitable question. “Africa,” my friend answered laconically. As we left the store, I asked her why she gave such a vague, general answer, why she didn’t say she was from Ethiopia. “Most Americans? They don’t care. All they know is Africa.” She was also smiling, I should add. My friend was not a bitter or resentful person. Over the years, again and again, I have noticed Americans referring to Africa as if it were a country rather than a continent. And yet they would never say of themselves that they are from “North America,” and if their question to a foreigner were answered with the name “Europe,” they would press for a specific country. Only when it comes to the continent of Africa does the parallelism break down, and when I hear examples, I am embarrassed for my fellow Americans. Climbing and clambering. The ‘b’ is silent in the first, and pronouncing the second with a silent ‘b’ is perfectly acceptable, also. I prefer it that way for the parallelism. (Scrambling, on the other hand, needs its ‘b’ sound because of the ‘l’ that follows.) It wouldn’t surprise me to learn there are differences in the pronunciation of the word clamber from one part of the United States to another, and it may be one of those words (I’m not looking it up, but you are welcome to do so) about which the English apply a rule different from ours. The English so often have their own way of pronouncing words. Schedule, for example. Countries sharing a language, like siblings sharing a bedroom, are in frequent disagreement over what is allowable, sharing and dispute being two sides of one coin. Foralongtimeinhumanhistorylanguagewaswrittenwithoutpunctuationandwithoutseparationbetweenwords. That we separate words now and punctuate sentences is a matter of convention. Some find the fluidity of language maddening, but one might as well be maddened by the evolution of plant and animal species. 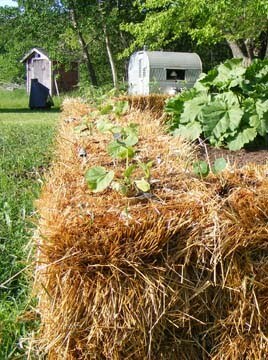 Part of my garden this year is planted in the ground, part in straw bales, and a few items in wooden boxes. In the boxes are chard, spinach, kale and leaf lettuce, the lettuce only in double rows. Parallel rows. 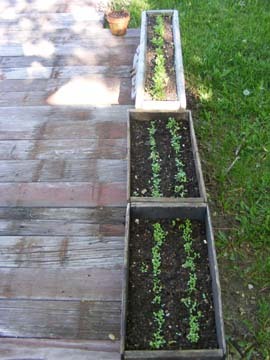 The boxes, as you can see, are placed end to end rather than parallel, for easier care, and as the greens have come in, the original seed rows have disappeared beneath the plants. Rabbits—amazingly, incredibly—have not bothered anything in the boxes. Yet! Very young children are said to engage in “parallel play,” which means that they are playing in solitary fashion in one another’s vicinity—for example, two children in the same room, playing on the floor, each absorbed in his or her own make-believe. Around the yard in summer, David and I often engage in parallel work. When one of us finishes a job, we show off our accomplishment and invite the other’s appreciation. 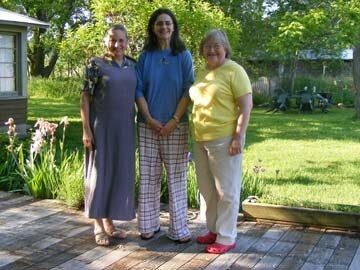 Teachers of composition and speech are keen on parallelism. I like it, too. I feel in it an aspect of the more general idea of equality, something we feel before we conceptualize it at all. I was surprised to finish reading Paul Auster's Hand to Mouth: A Chronicle of Early Failure so quickly. There were so many pages left, two-thirds of the physical book or so, but three appendices had swelled the volume. I didn't read the appendices. I did put the memoir on my "Books Read" list. This has nothing whatsoever to do with parallelism. So while we're off the subject, how do you feel about arugula? Somewhere I read once that all women, from girlhood on, are either pioneers or princesses. Is this true only of American women? I wonder about that, but no matter. Any girl who refuses makeup, whose favorite article of clothing is her father’s old Carhartt jacket, who learns to shoot better than any of the men in her life and who can dress out her own kills, tan the animals’ hides and survive on their meat—this girl is no princess. Meet Margo Crane, sixteen years old at the beginning of Bonnie Jo Campbell’s new novel, Once Upon a River. "I’m not a river spirit. Why do guys always want to make a girl into something other than what she is?” Margo asked. She was not a wolf child, as Michael had called her. Even her grandpa’s naming her Sprite and River Nymph seemed odd now, as though he wanted her not to be a person, exactly. Margo Crane is nothing and no one if not her own person. She is self-reliant and stubbornly independent. Even the mistakes she makes are her own, not just those of someone her age or of her generation. Like the Water Rat in Kenneth Grahame’s Wind in the Willows, Margo takes the river as her companion early in life and never leaves it. This character’s life reminds me somewhat of the life led by Harlan and Anna Hubbard on the Ohio River, memorialized in Harlan’s book Shantyboat. Margo’s specific river world, however, is set solidly in southwestern Michigan, and hers is a very different kind of story. Margo Crane, a girl of few possessions and little school learning, owns a single book, a life story of Annie Oakley written for children called Little Sure Shot. Annie’s skill with a gun and estrangement from her mother make the Wild West girl sharpshooter’s life meaningful to the 20th-century Michigan teenager, but other than that reading doesn’t interest Margo much. She certainly has no knowledge of esoteric religious practices. Yet Margo’s shooting is pure Zen. There was nothing in the world but herself, her rifle, and her target. She exhaled and pressed the trigger. She held steady as the bullet left the chamber and then the barrel. At least one reviewer has compared Margo Stark to Huckleberry Finn. Yes, both Huck and Margo abandon society’s rules for life on the river, and both are quintessentially American stories, but Margo is no female Huck. For one thing, she has sexual partners. Yes, more than one. She is sometimes willing, sometimes unwilling (so those men are not true partners), sometimes eager. Neither does Campbell’s story descend into silly chaos at the end; her touch as a writer is sure and masterful from first page to last. Bonnie Jo Campbell’s previous novel, Q Road, did not get the attention it deserved. I’m betting Once Upon a River will receive very different treatment--and that readers of this new book will then want to go back and discover the earlier novel. Q Road took place on land, with more than one protagonist. Once Upon a River belongs to Margo and the river. I'm crazy about the first, and there are whole paragraphs and entire chapters of this new novel that I want to lift out and frame and gaze into and lose myself in. I have never hunted or even owned a gun, but I know the river worlds of southwest Michigan from many paddles and floats down the Paw Paw, the Little Rabbit and other geographically minor waterways rich in the varieties of nature Campbell describes. Those river adventures that form some of my most vivid and precious memories of life before Up North, and Campbell takes me back there. But best of all is living vicariously inside the character of resourceful, self-sufficient Margo Crane, an American heroine for the ages and for the pioneer in all of us, women and men alike. She's an American original. The photo above was taken in early morning in early June, which explains all the empty parking spaces. We’re much busier now. 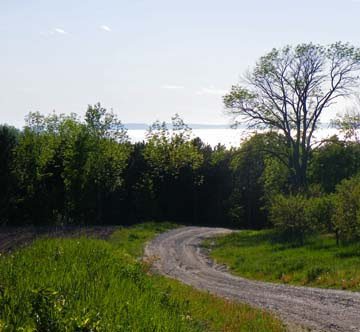 In fact, mid-June felt like July in a business sense, I'm happy to say (and I'm also happy that the weather was not yet midsummer broiling), but I decided to open today’s post with this photo because I like the light coming over Grand Traverse Bay and always enjoy the view from the top of Nagonaba Street. If you came into town this way, you’d be coming by the back streets, and down at the corner by the Filling Station you’d turn right to reach Dog Ears Books. “This is the beating heart of Northport!” one of my fans exclaimed the other day as he walked in the door with a big, gusty, satisfied sigh, happy to be here. Welcome as the compliment was, I couldn’t help thinking I knew better, and I sighed, too, but with less satisfaction. My sigh was, in fact, a bit wistful. There are some people—many of them summer visitors--for whom my bookstore is important, but it’s hardly the community hub, as the long "off-season" makes painfully clear. Then I got to thinking further about about the question. What would you say is the “heart” of our community or yours or of any other? In Northport, some people identify Barb’s Bakery, their daily social contact place, as the community heart or hub, and for some it is. Yet there are other locals who never sit down to gossip at the coffee table at Barb’s. 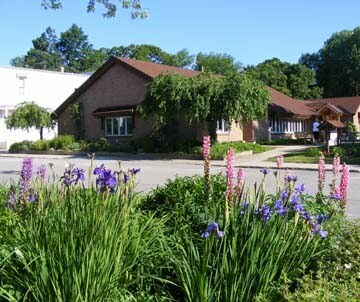 Our small but beautiful township library, where Deb Stannard, the librarian, has a gift for making everyone feel welcome, must be the heart of Northport for many, while for others the school or one of our five churches would be the most important place, the center of social and/or spiritual and/or intellectual life. Her words touched me. I was grateful to her for saying that. As an individual in business in a small village, it was good to hear, but her formulation is good, I realized later, in a more general way, too, because it means that any community will have many hearts. What would it mean, after all, for our town or any other if there were only one beating heart and that heart stopped? No one is indispensable, but we can all be important to others by giving of ourselves. 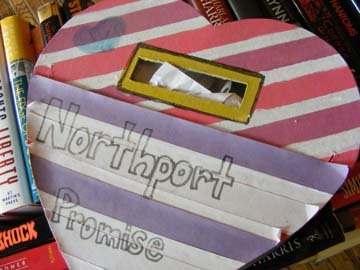 Community reminder: June is the third month of the second quarter of the year, so Tom’s receipts for the Northport Promise scholarship program need to get into Promise boxes by the end of the month. The official poster isn’t here yet, but the book is, and the author gave me an extra dust jacket to use in the window until the poster arrives. 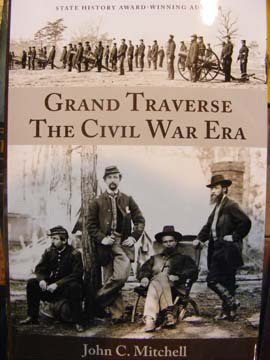 Yes, a new book on the Civil War period has come out in the last week, and while I’ve been eagerly awaiting it, John C. Mitchell’s Grand Traverse The Civil War Era is much more than I had expected. “It’s not military history,” he told me. “It’s Civil War lives and times.” So much the better, from my point of view. I sat down to look at the pictures and became engrossed in the first chapter. Mitchell has gone back to the early history of our region to set the stage in detail before exploring the years 1861-65. Thus his tale begins with George and Arvilla Smith in northern Vermont and Joseph Waukazoo in the Kalamazoo Valley—and if you know your Northport history, those names will be very familiar. Also familiar to locals is the name of “King” James Strang, but I had forgotten or never knew much of Mormon history in northwest lower Michigan. Did you realize that the whole Beaver Island archipelago, including the Fox and Manitou Islands, was once its own county? Manitou County, 1855, was established by the state legislature to isolate Mormon voting power offshore, Mitchell writes. And then, of course, political dissension over slavery was building toward war across the continent. The author traces national debate and legislation on the slavery issue through the 1840s. With the auction blocks as a backdrop, Congress passed the Compromise of 1850 in the hopes of fostering an elusive peace within the nation. ...The issue of slavery, long avoided in polite conversation, was now thrown in the face of Yankee sensibilities as slave catchers fanned out through the Free States. The reality of slavery was brought home to the big cities and small farms of the North as slaves were dragged away in chains. Rather than promote peace, the law destroyed what middle ground was left between the two distinct societies. The fires of confrontation were now burning, and the nation began its decade-long slide toward Civil War. 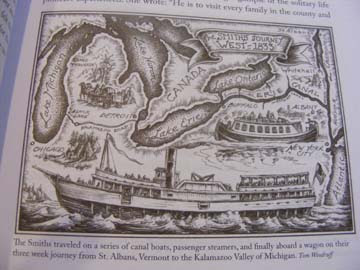 There was a lot happening in the new State of Michigan (admitted to the Union only in 1837) before the outbreak of war. The opening of the Soo Locks, for example, increased the North’s advantage in the coming conflict, as well as changing Great Lakes shipping forever. 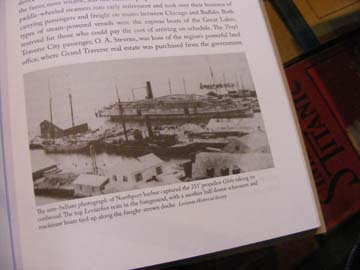 Bricks for the new Grand Traverse Lighthouse arrived in Northport harbor on May 6, 1858. The first mail carrier in Grand Traverse County, Jake Ta-Pa-Sah, brought letters and newspapers up from Grand Haven along a well-established Indian footpath, connecting northern Michigan to the rest of the state. A historic photo from Mitchell’s book of the harbor in Northport gives some small idea of how much was going on here prior to the Civil War. Lots! 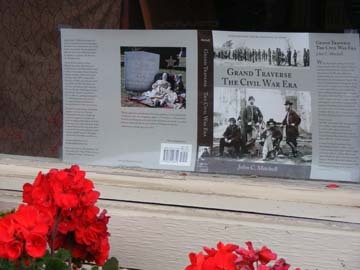 I’m not reviewing Grand Traverse The Civil War Era at this time because I have so much of the book still to read and absorb, but I’m excited about it and know others will be, too. “I tried to get out of the way and let the stories tell themselves,” the author said the other day when he delivered a second box. (The books are selling that fast.) Mitchell’s writing style is engaging, the stories captivating, and Tom Woodruff’s illustrations, along with photographs from the period, add concrete visual images to the ones that will be created in readers’ imaginations as they are pulled into this book. There are stories of soldiers, to be sure, but there are also stories of women and children at home and ordinary Americans in many different occupations. Signed copies are available now at Dog Ears Books for $24.95 + tax (total $26.45). Orders welcome—cash, check or money order only, please. Additional Northport note from the current events calendar: Music in the Park begins this Friday, June 24, 7 p.m., with the classic rock sound of Zen Stew. The rain should be over by then. 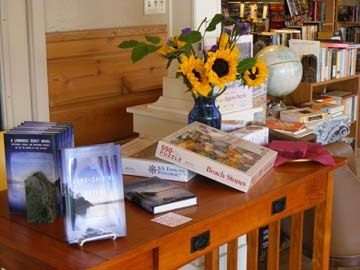 Continuing our Lake Superior month at Dog Ears Books, here is the signing table on Monday, ready for author Danielle Sosin. The table looked even better when Danielle arrived and was seated behind beautiful crisp new copies of The Long-Shining Waters. 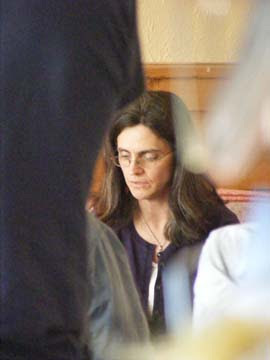 I especially like the next picture (below) of the novelist, smiling broadly at something a book customer must have said. Most likely it was a compliment. She received many. Sosin did a reading for us, too, on Monday. The first passage she read included the excerpt I used to as an introduction to my preview to her visit. 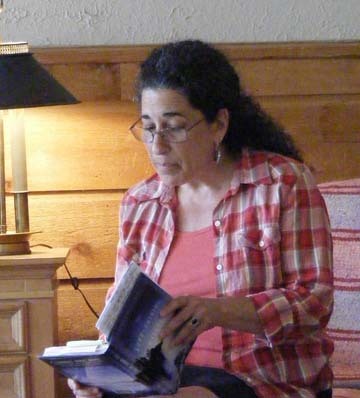 Danielle is an excellent reader of her work, as was true of our other Lake Superior author, Ellen Airgood. How fortunate and pleasurable for those of us present at the events! One of my confident guesses was wrong, though. Sosin does not write poetry. At least she says she doesn't, but I am not the only one to notice and mention the very lyrical, poetic quality of her prose. In one respect I'm getting either a little smarter or a little luckier lately. Thanks to David photographing me the other day with Ellen, and then Edie and Bruce taking cameras in hand to snap Danielle and me together, this month I have the documentation to prove that I did meet these writers, in person. Here's the latest proof! 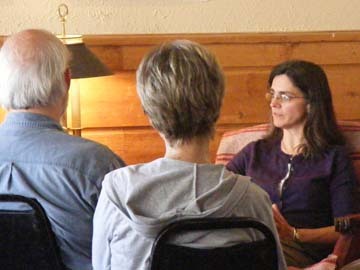 If you missed Danielle in Northport, here is where she will be for the next three days--Tuesday in Petoskey, Wednesday in Traverse City, Thursday on Mackinac Island. Check out her website for bookstore names and times of appearance. Following Mackinac Island, she will wend her way back to Duluth along--what else?--the Lake Superior shoreline. I have two signed copies left: first come, first served. From below, the surf churns grey and white. 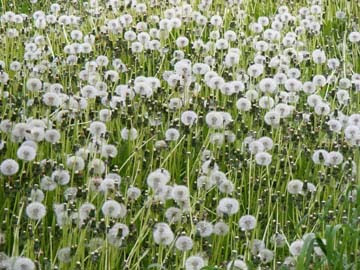 It billows like the bottoms of clouds, creates a sound like rolling barrels, or the distant muffled stampede of horses. What prickling sensation at the precipitous drops—one hundred feet, two hundred feet, and more—where the slow-growing fish feed. The herring and the whitefish I once sought. The rising siscowet and the trout. Suspended overhead like long dark shoes. Like deeds left undone. The shape of regret. That’s a preview, and here’s the reminder: Danielle Sosin will visit Dog Ears Books on Monday, June 20. The excerpt above is one of her novel’s poetic passages set between chapters that follow the lives of three women on Lake Superior in, respectively, the years 1622, 1902 and 2000. Nuruddin Farah, author of Book of Knots, called The Long-Shining Waters a “truly inspiring and ambitious work of fiction,” and Publishers Weekly said, “Sosin writes sensuously detailed prose and distills he emotions of her characters into a profound and universal need for acceptance and love.” Sosin’s previously published book was a collection of short stories, Garden Primitives, but I can’t wait to ask her if she also writes poetry. (I can’t believe she doesn’t.) 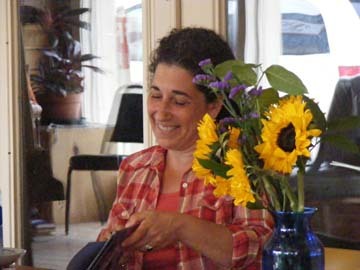 Please come by around 1 p.m. on Monday to welcome Danielle to Northport and talk to her about her book, which she will sign for you with pleasure. Now for a report on Ellen Airgood’s first trip to Northport. We had a wonderful time! Everyone had a wonderful time! Her visit featured only two unfortunate aspects: the first was that Sallie, Ellen and Rick’s dog, did not get to make the trip this time (well, and neither did Rick! ), and the second was that I was so busy tending to business during Ellen’s two hours at the bookstore that I didn’t get many pictures of her at Dog Ears. Here are a couple, anyway—Ellen visiting with customers and Ellen glimpsed through the crowd, reading from her novel. Luckily for me, we had her as a houseguest for two nights. “I feel so at home here,” she said. “It smells like the farmhouse where I grew up.” Sarah, who loves company, enjoyed Ellen’s companionship almost as much as David and I did. There was another treat for Sarah, too, in that Gerry Sell from Torch Lake Views drove clear around Grand Traverse Bay with her famous dogs, Miss Sadie and the Cowboy, and the three of them stayed overnight with us on Friday, too. Sorry again, Sallie! 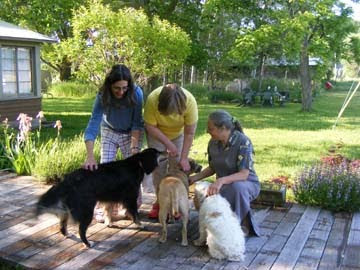 You missed the guided (outdoor) tour Sarah gave her doggie guests on Saturday morning! 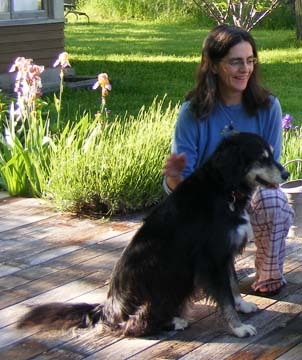 Once the dogs were rounded up again, Gerry and Ellen and I enjoyed morning coffee in relatively leisurely fashion on the front porch, talking about books and writing and dogs and such, and David kindly documented the meeting before we all went our separate ways. We are headed now toward the longest day. Coreopsis is coming into bloom. So soon, so soon! 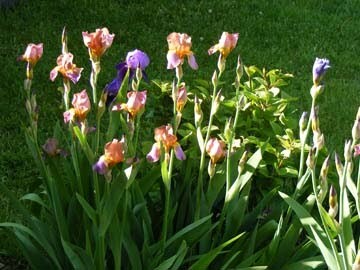 How quickly the long, rich, beautiful days of June slip away! 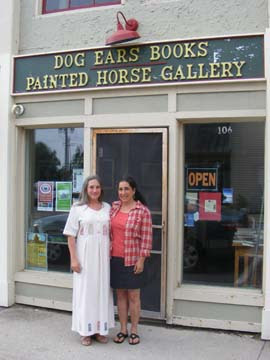 Summer 2011: Ellen Airgood will be the first featured author of the season at Dog Ears Books in Northport. 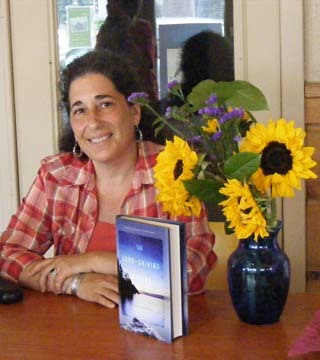 She will be here Friday, June 17, from 4 to 6 p.m., to answer questions about her writing life and her recently released novel, South of Superior, and to read from and sign her book for customers. Here in advance is some of her background from the author herself. I grew up on a small farm, the youngest of four children. My father was a blacksmith and a schoolteacher. For the last nineteen years I’ve been a waitress in Grand Marais, Michigan. I was twenty-five when I came to this tiny Lake Superior town, on a camping trip with my sister, and fell in love with the man who made my cheese sandwich and chocolate malt at the local diner. We met, exchanged assessing, almost challenging gazes, and six months later we got married. I told my sister we would, on the way back to our campsite that first day. “You’re crazy,” she said worriedly. But pretty soon she grinned, shook her head, started getting into the spirit of it. “Well,” she said, “this is going to be interesting.” And it has been. I’ve never been sorry. My husband Rick and I run a diner together, a job that is always consuming, often punishing, and hugely fulfilling. Most of what I know about maturity and compassion, not to mention story, I’ve learned from waiting tables. We work eighty to a hundred hours a week together almost year round, and one way or another we’ve faced the constant barrage of setbacks and frustrations and equipment failures that restaurant work is, the high stress and long hours. There is so much satisfaction in it, though: the goodness of hard work, the joy of feeding people a meal they love, the delight of long friendships, the pride in a job well done. All kinds of people come here from all kinds of places, and we get to meet them, to hear their stories, and pretty often we get to make them happy for the time that they are here. This is the route I took to becoming a writer. I didn’t get an MFA or study writing in school. I could have learned about life anywhere, but fate brought me here, to the end of the earth and a tiny town that time forgot. My customers have given me good practice as a storyteller, too. It’s a matter of survival. If I can entertain people, draw them over to my side, they won’t murder me when I’m the only waitress on the floor and the cook is swamped and the wait is long and we’re out of silverware and I didn’t know the fish was gone when I took their order. 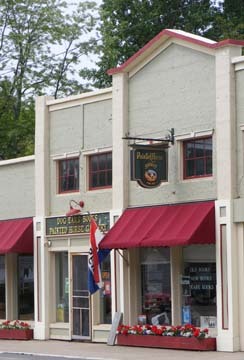 Fate brought me, your bookseller-blogger, to a little town on Lake Michigan, not at the end of the earth but nearly at the end of the road. The joys of bookselling, like that of running a restaurant, involve the making and maintaining of friendships. There is also introducing people to books and introducing book people to one another. 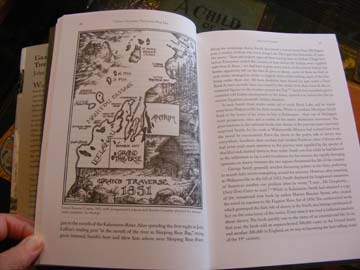 Books are another kind of nourishment, and it is my pleasure to bring our good friend from the U.P. 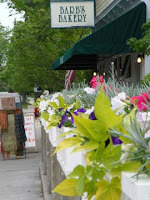 to Northport and to be able to offer for your delight her debut novel. Postscript: If you don't know Christopher Morley,introduce him to yourself with this short essay on the thrill of visiting bookshops with an explorer's attitude of discovery, and you'll see why we booksellers with open shops continue to adore this writer as the world whirls by our doors. May or June? Lake Superior or Lake Michigan? Both and Both! 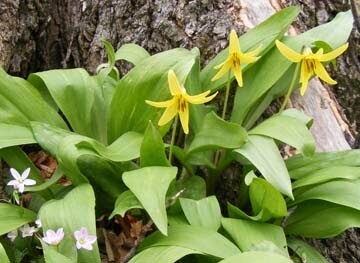 The wildflowers in the woods are at their peak in the merry month of May, and there is always a single magical day in May when I would give anything for a PAUSE button. It’s that day when the smallest flush of first leaf and bloom takes the winter nakedness away from trees, that perfect Impressionist moment of light and color after months of winter and early spring drab. When May arrives, it is the best time of the year. It’s a miracle, time after time. Then along comes June and steals my heart, for what is so rare as a day in June? 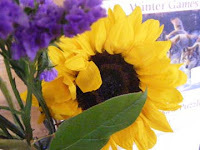 June is the culmination of spring and the beginning of summer. If May is the courtship, June is the wedding. 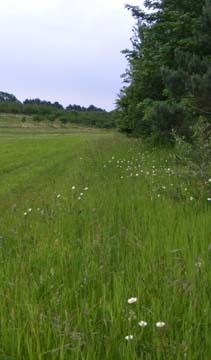 The days are not all sunny (in either month), but the season rushes on, relentlessly filling and greening. This year June is extra-special for me, "Lake Superior Month" at Dog Ears Books, so to introduce the theme, below is a photograph of Lake Superior at Hurricane River, west of Grand Marais, from our last September's all-too-brief getaway. A week from now, on Friday, June 17, we will be hosting the Leelanau launch of Ellen Airgood's South of Superior. I've written about this book before and about Ellen and about my love affair with the Upper Peninsula and particularly with the little town of Grand Marais, the model for Airgood's fictional McAllaster. As wonderful coincidence would have it, the following Monday we will have a visit from another author whose novel is set on Lake Superior. 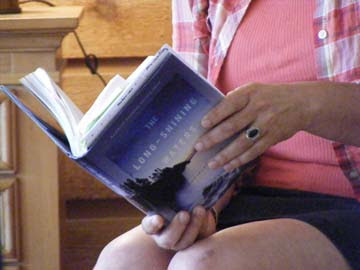 Danielle Sosin, from St. Paul, Minnesota, will come to Northport to sign copies of her book, The Long-Shining Waters, at 1 p.m. on June 20. I hope some of you will be able to meet both of these talented authors and welcome them along with me to Lake Michigan country. 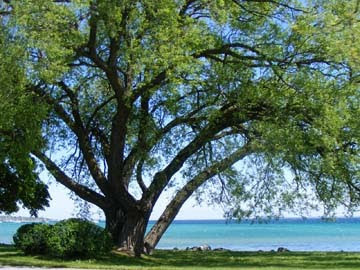 I'll end today's post with an image of Lake Michigan at Peterson Park. 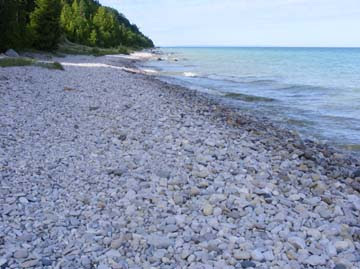 I could have chosen a sandier beach, perhaps a dramatic sunset over Good Harbor, but Leelanau Township is my home grounds, and this cool, morning-shaded, rocky strand is a favorite summer haunt. 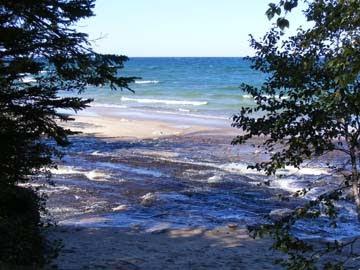 Besides that, I feel rich to have it all--May and June, Lakes Superior and Michigan, the rocks and the sand and the Michigan authors and their books. L2: "I've been reading Hannah Arendt's Rahel Varnhagen in an attempt to polish as essay to send out. I plan to reread the 2nd and 3rd volumes of Foucault's History of Sexuality for a couple of conference papers. Oh, and the Sookie Stackhouse vampire novels. Hee hee." D: "I loved The Lacuna. FWIW, I'm reading the latest one by Alan Bradley, who wrote The Sweetness at the Bottom of the Pie, a mystery of sorts whose main character is a 11 year-old girl chemist." P: "Internet protocol standards documents. It's all I read anymore. I do have a copy of Wittgenstein's Poker sitting on my table, and a James Thurber collection, but the bindings are barely cracked." It's obvious who is the IT person and who is the minister, but would you hazard a guess on the professions of the others? It would be a dream to be together again! Only--instead of "that room," I'd have, if I could, my philosophy friends gathered here at my old farmhouse, where we would drink wine out by the meadow and once again argue over interpretations of the song "City of New Orleans" (as many interpretations as philosophers in the conversation) as the moon rose over the woods. Bruce works in the bookstore on Monday, which means I don’t have to wait until evening to get out in the garden. Can’t say I got outdoors before sunrise today but early enough. Lots of work to do, and I got everything done that I'd planned. After hours of gardening, when I was hot, sweaty, stinky, dirty, achy and tired but very satisfied with all of my accomplishments--oh, also hungry, I should mention--I came indoors for a lunch break (leftover spaghetti) and a little more reading of Robert Pirsig. Will you believe that so soon after re-reading Zen and the Art of Motorcycle Maintenance, I’ve gotten into Lila: An inquiry into Morals, the author’s second book? For some reason when I tried this book once, it seemed trivial and superficial and a waste of time. I must not have gone far enough into it. Like his first book, the author weaves his philosophy into a travel story and tests his ideas against his encounters with other people, and maybe it’s because I just came from such a close reading of the first book, but this time I’m finding Lila gripping, and now in Part III, by a strange coincidence, I find myself reading exactly what a friend wrote to me about this morning in an e-mail. How coincidental that my friend should send me a link to an article about facts not changing minds on the very morning I'm reading about the same phenomenon in Pirsig's book. The anthropologists established a second point: not only does insanity vary from culture to culture, but sanity itself also varies from culture to culture. . . . Each culture presumes its beliefs correspond to some sort of external reality,but a geography of religious beliefs shows that this external reality can be just about any damn thing. Even the facts that people observe to confirm the "truth" are dependent on the culture they live in. A child in a money-society will draw pictures of coins that are larger than a child in a primitive culture [will draw]. Moreover, the money-society children overestimate the size of a coin in proportion to the value of the coin. Poor children [in the money society] will overestimate more than rich ones. A couple of pages later the first-person narrator, presumably Pirsig, recalls taking his boat toward Cleveland and stopping along, thinking he was in a harbor 20 miles down the coast. He asked how far it was to Cleveland and was told he was there. He couldn't believe it, as he'd been following his chart. Then he remembered the little "discrepancies" he had seen on the chart when he came in. When a buoy had a "wrong" number on it he presumed it had been changed since the chart was made. When a wall appeared that was not shown, he assumed it had been built recently or maybe he hadn't come to it yet and he wasn't quite where he thought he was. It never occurred to him to think he was in a whole different harbor! It was a parable for students of scientific objectivity. Wherever the chart disagreed with his observations, he rejected the observation and followed the chart. Because of what his mind thought it knew, it had built up a static filter, an immune system, that was shutting out all information that did not fit. Seeing is not believing. Believing is seeing. You know how old woods hands say that when you're lost in the woods you should always believe your compass, especially when you're tempted to think it's wrong? This is why. If this were just an individual phenomenon it would not be so serious. But it is a huge cultural phenomenon too and it is very serious. We built up whole cultural intellectual patterns based on past "facts" which are extremely selective. When a new fact comes in that does not fit the pattern we don't throw out the pattern. We throw out the fact. A contradictory fact has to keep hammering and hammering and hammering, sometimes for centuries, before maybe one or two people will see it. And then these one or two have to start hammering on others for a long time before they see it too. Just as the biological immune system will destroy a life-saving skin graft with the same vigor with which it fights pneumonia, so will a cultural immune system fight off a beneficial new kind of understanding. . . with the same kind of vigor it uses to destroy crime. It can't distinguish between them. None of us is immune to having an immune system. It’s easy to laugh at the people who spent all their savings a couple weeks back, convinced that the world was going to end, but each and every one of us has blind spots (smaller ones, we hope) that evidence doesn’t penetrate. Moreover, between the "intellectual immune system" of one individual and the "cultural immune system" of an entire society, of course there will be subcultures with belief systems that have the same kind of immunity, rejecting what doesn't fit their cherished patterns. When you realize this, you have to be amazed that anyone ever changes his or her mind about anything or lets in new, challenging information at all. What new challenge to a strongly held belief can I entertain today? How seriously can I take the arguments and evidence that oppose my view? I have too much on my plate to go hunting for an argument, but if one comes my way I’ll try to listen with an open mind. Gardening is good for so many reasons, but I particularly love being outdoors and working physically and mentally at the same time. 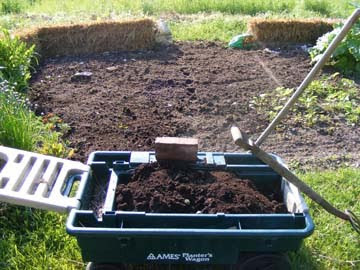 Then, look at this beautiful compost! It’s full of big, healthy, wriggling worms, too, worms that are all ready to go to work for me for free, while I'm indoors reading or up in Northport selling books. The bales are all planted, bean seeds are in the ground, lettuce in boxes where it will be decorative until we harvest it—either that or the rabbits will think we’ve spread a special buffet table just for them, but I’ll worry about that when the evidence presents itself. Long before sunrise, the earth still giving off its cool breath in the dark and waiting for the return of light to warm it again for the hours ahead, birds begin to sing. A cricket adds its song from nearer by, mistaking the morning chill for autumn. 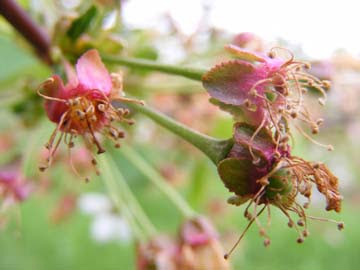 Dew collects on the stems and leaves of grass and the petals of flowers, while leaves hang motionless on trees. Day and its demands are still at a remove, David and Sarah snug in sleep. This time is mine, and I am living another one of my imaginary lives. The air that moves through the open porch window is less than a breeze, less even than a sigh. My parents’ house had a front porch like this, smaller but facing west and with windows on three sides. Across the road from that house then were farm fields, cropped in a corn-soybean rotation unrelieved by departure from routine or by imagination of any kind, but I had no trouble adding the imagination. This was the West, and out beyond the soybeans was the range. Watching sunset over the corn in summer, I could see in my mind clear to the Rocky Mountains. Slightly to the north in those fields was a rectangle of untilled land. Only one small tree was visible from a distance, but I had explored to the spot on foot and knew about the cold, clear spring and the large rocks and the wild grasses and flowers, and this is where I would keep my horse when finally that girlhood dream came true, as surely it must. I would build a shed next to the tree and a fence around the perimeter of the untilled land to separate it from the row crops. Of course our time together, my horse’s and mine, would not be so tightly bounded. The world beckoned! Not the world of the East, the crowded towns and suburbs and shopping malls, but the wide-open world of the West, where a cowgirl would have room to breathe and move in freedom. In Some Horses, a book I fell asleep reading last night and picked up again at 4 a.m., Tom McGuane writes of the way that “to go forth with an animal” enlarges both human and nonhuman, making the whole greater than the sum of its parts. Poor horsemanship consists in suggesting that man and horse are separate. A horseman afoot is a wingless, broken thing, tyrannized by gravity. defeated, aging little man; or a crone, where moments ago a demon or a fire queen filled us with obsessive attention. And even the horses are turned into weary pensioners as, with empty saddles and lowered heads, they are led to their stalls to rest. For that burst of poetry, horse and rider have one another to thank. In my girlhood dreams, I was as often the horse as the rider. Because we have co-evolved with canines and equines, a close bond is possible with individuals of these other species, the closest we can get to returning to Eden. It don’t need no talk, it don’t need no plan. It’s a more basic kind of knowing, and just the possibility of it in the world brings me a peaceful morning feeling. Down on the other end of the porch in her window seat, Sarah raises a sleepy head. There is the faintest shade of rosy lavender in the sky over the barn roof, a reflection of dawn behind the house. Soon we will go outdoors. I don’t have a horse, but I have a dog, and I wouldn’t trade her for a dozen horses. The world we share is not the open range, but I wouldn’t trade that, either. Northern Michigan is perfect for us, thanks. There was a sunrise and bright sunshine for a little while, but as Sarah and I went outdoors the grey clouds were already starting to move in. No good, clear shots of Lake Michigan for the blog today. The cherry blossoms are almost gone, too, starting their turn from flower to fruit. No, no cherries yet. We have to wait. 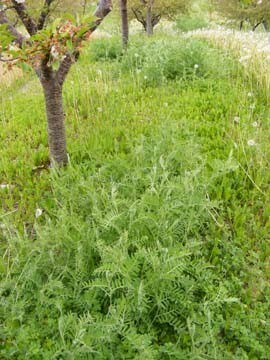 Dandelions have gone to seed, but soon the vetch will be blooming deep purple. Soon. Not quite yet. Our weather today is all of a fidgety-fidge. With “isolated thunderstorms” in the forecast for the rest of the afternoon and through the night, it feels very unsettled, and I’m unsettled, too, so close to the end of Bonnie Jo Campbell’s Once Upon a River that I am rationing my reading to a few pages at a time to put off reaching the last page of all. It’s going to be hard to wait for the book’s July release when I can share it with other people at last. Fidgeting? Yes, but happily so. 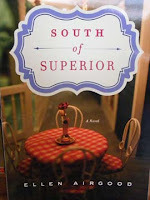 After all, Ellen Airgood will be here at Dog Ears just two weeks from today, and her novel, South of Superior (which I’ve already read twice in ARC) has a release date of June 9. That’s next Thursday! I’m hoping my order arrives before the end of next week so the people waiting for it can dive in before Ellen’s visit. Sometimes fidgets aren’t restlessness or discontent but simple excitement. June is a very exciting month! Tourists coming north on M-37 enter Traverse City on a road that is called Division Street in town. 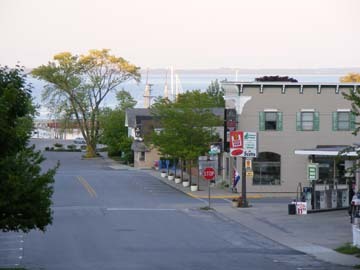 After Division intersects Front Street (a left turn would take you into my old neighborhood, a right turn leads downtown), it’s only a few short blocks to Grand Traverse Bay (above), and at that point the tourist can turn right and follow M-37 out to the tip of Old Mission peninsula, where that road ends, or turn left and pick up M-22 at the county line, entering Leelanau County. When David and I have errands in Traverse City, there is no decision to be made when we reach the bayshore. The left turn takes us home. 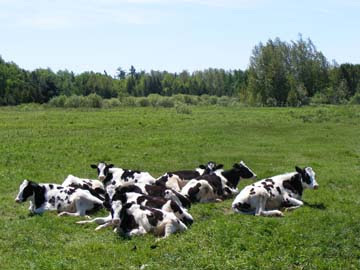 There are, however, many roads home through the county, and yesterday after an errand out M-72 we took “the Cedar way,” turning just past Cedar toward Lake Leelanau past these contented young cattle. It was a good way to go home and then back up to liberate Bruce and finish out the day at the bookstore before adjourning to Stubb’s Sweetwater Grill with friends visiting from Panama. Later in the evening I got back to my advance copy of Once Upon a River, by Bonnie Jo Campbell, slated for July release. 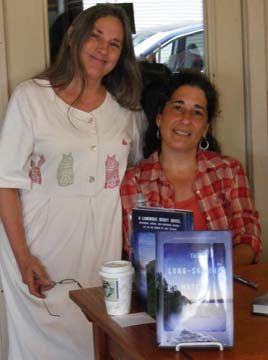 Bonnie will be making a flying visit to Dog Ears, as will Danielle Sosin, whose novel The Long-Shining Waters, set on Lake Superior, I have just finished reading. (See calendar at right for dates and times.) I will need to tell you more about both of these books, but my important reminder today is that it’s only two weeks and a day until Ellen Airgood’s Northport appearance, and I am very excited and eager for that event and hope for a great turnout on Waukazoo Street. Ellen’s story in South of Superior also, like Sosin’s, takes place on the shore of Lake Superior, and it’s got me realizing how watery my 2011 author lineup really is. For real-life adventure, of course, we'll have Loreen Liewenhuis and A 1000-Mile Walk on the Beach and, when fall arrives, The Windward Shore, by Jerry Dennis. Would you believe that this "water theme" came together completely by coincidence? I didn't plan it, but there it seems to be, and what do you expect when our entire state forms two peninsulas? Elizabeth Buzzelli’s new murder mystery might seem an exception, but don’t forget that her main character, Emily Kincaid, lives on Starvation Lake! My new friend in Australia (no, we've never met) said she liked to imagine that I could see Lake Michigan on some of the walks I take with Sarah in my home neighborhood. Yes, indeed. This is a late yesterday view over waters shimmering almost white in the bright evening sun.